Sunflower Oil. Uses, Health Benefits of Sunflower Oil, History, Facts, Side Effects and Dosage. There are many, many oils and natural supplements out there for the looking consumer to get their hands on. The uses of these oils and remedies are almost as varied as the types of supplements themselves, if not more so. Sunflower oil has proven to be one of the most useful and physically beneficial in its application to cooking and health. Even more interesting is that sunflower oil is not limited to just one variety. There are two main types of sunflower oil, and each of them sports some unique properties. For example, high oleic sunflower oil is known for its high content of monounsaturated acids, as opposed to the linoleic variety that is rich in polyunsaturated fat. The second type of the aforementioned sunflower oil varieties, linoleic, is the one which is most widely used today. Both of these types provide benefits which have been known to lessen the severity of cardiovascular problems. Forms of saturated fat like butter, for example, have high melting points and become a solid at room temperature. Monounsaturated acids and polyunsaturated fat both have very low melting points compared to the saturated fats, and are broken down by our digestive systems much more efficiently. This makes them a far better choice for those trying to be conscious about the quality of food they are ingesting, and it is widely believed that the use of these unsaturated fats reduces the chances of a heart attack. There are several major known health benefits to consuming sunflower oil as an alternative to the aforementioned saturated fats. One of these benefits is the range of vitamins that sunflower oil provides. Vitamins D, A, and E are contained within the oil and are of rich nutritional value. The high oleic variety of sunflower oil has been compared to olive oil for its cholesterol lowering qualities, this is due to its monounsaturated fat content. The linoleic acid variety is known to contain certain essential fatty acids (or EFAs) which aid in a number of functions within the body. Sunflower oil and safflower oil have a significant amount in common such as they are both higher in essential fatty acids Omega-3 and Omega-6 than any other oils. Read more about other oils that contain Omega-3 and Omega-6 fatty acids: fish oil, macadamia oil, flaxseed oil. In babies predisposed to infection (such as preterm infants), sunflower oil has shown to work as a gentle barrier when applied to their skin, thus helping keep infections out. Babies are not the only ones benefiting from its cosmetic applications however, as high oleic sunflower oil has been a part of skin care products on store shelves for years for its renowned ability to help the skin retain moisture. Ever since restaurants have been cracking down on the use of unhealthy saturated fats, sunflower oil has been looked at as a great and tasty alternative. Use as a frying oil is not the only health application known to sunflower oil, some people simply take it in small quantities as a nutritional supplement to get some essential fatty acids into their system. Early production in Mexico was simply putting the seeds into a pestle and mortar and grinding them into a workable flour. As time progressed and things became more industrialized, the method of extracting sunflower oil reached its modern day method, which is broken down into stages. The following steps are simplified for explanation sake, but these are the typical stages of oil extraction. First the seeds are cleaned and washed, then dried out. After the seeds have been dried, they are heated to a warm temperature, this aids in oil production. Once the clean seeds have been heated, they can be pressed for their oil content. There are other ways of getting sunflower oil out of the seeds, some of which use solvents, a ram press, and oil expelling machines. Which type of extraction method is used depends on the scale of the extraction and the resources of the company or individual doing the extraction. Did you know that in recent years, roughly half of sunflower oil being produced is being exported? Of that exported oil, close to 90% is in the form of crude oil. In 2002 and 2003, the NuSun domestic sunflower oil increased domestic sales, which changed the established balance of sunflower oil exports. This means that the percentage of sunflower oil purchased here domestically started to outweigh the amount of oil being shipped out. Once this occurred, the refined form of sunflower oil was being more widely produced than the crude oil version. This also changed the statistics of oil being exported, because in 2005 around 80% of sunflower oil leaving the country was the refined variety that we know and love. This is a trend that is expected to continue into future years, with modern export percentages ranging from only 20-30% as opposed to the 35-50% range of earlier years. 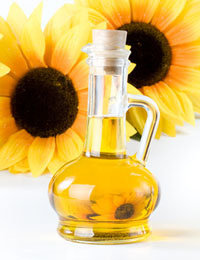 Sunflower oil is widely used in the culinary and food preparation world. It works well as a frying oil, and is known to be much easier on the human body that other frying oils. The flavor is often described as light and nutty. In most applications which olive oil can be used in cooking, sunflower oil is also useful. Aside from its place in the fried food world, sunflower oil is brilliant at perking up a salad as a dressing or added to a sauce. Some of the more unexpected and interesting uses of this remarkable oil is in the automotive industry. Tires are being made that include sunflower oil to help with traction for driving in certain environments. This is because when sunflower oil is added to tires, it helps the rubber hold its flexibility even in harsh sub-zero temperatures. Motor vehicles have benefited from the use of this oil as well. Aside from being much better for the environment, and being a renewable source of energy, it burns cleanly and is less harsh on engines than petroleum oils. Storing sunflower oil properly is a simple task, as with any other oils it should be put in a dark cupboard at room temperature. Avoid extremes in temperate and exposure to any outdoor elements. Keeping it away from direct sunlight for prolonged periods of time is also recommended. In conclusion, there is no question that the sunflower is an amazing and powerful plant with many applications, both culinary and practical. The flower itself has brought joy to millions with its vibrant yellow colors, and has been around much longer than we have been extracting the oils from its seeds. It has provided us with a way to be healthier, a way to replace our consumption of bad fats with good fats, and a delicious taste as well. For many years to come it is likely that sunflower oil will be the choice of consumers everywhere for frying, skin health, dieting, and more. Read more about useful oils: coconut oil, almond oil, oil of oregano. hello we use palm oil fpr adding to our product(dates) can we use sunflower oil instead of palm oil if yes for what reason? What does sunflower oil do for my skin and hair ?? Just tried sunflower oil. I loved it. What is your price? want to know the price sun flower oil. I recently bought a cuticle oil for my nails that contains sunflower oil, I’m just curious as to what type of oil it could be? Would it be the same sunflower oil like the cooking oil, or is it a different type of oil all together? High Oleic sunflower oil is refined, meaning the PUFA’s (omega 6 and omega 3) are ruined. And when heated the PUFA’s are destroyed even more leaving very little nutritional value. Furthermore, there is no omega 3 in sunflower or safflower oil. Please get your facts correct. It is the crude (unrefined) oil that has numerous health benefits. It is loaded with omega 6, an Essential Fatty Acid, meaning you must get it from food or you die. Contrary to popular belief omega 6 is far more important and beneficial to optimal health than omega 3. Simply put it is the processing and heating of omega 6 that causes health problems and the negativity surrounding omega 6. Copyright © 2011-2019. Sunflower Oil. All Rights Reserved.